You can change visual appearance of almost every element of this Magento theme. Ultimo supports wide screens. In the admin panel you can select the maximum width of the page (from 1024 to 1680 pixels) or even specify your custom non-standard width. Ultimo is optimized for all screen resolutions. If you resize web browser window, theme elements will be transformed smoothly on each breakpoint (from 240 to 1680 pixels) in order to adapt to the current screen size. Width of the page is fluid – theme uses 100% of available space (below specified maximum width) to display content [demo3]. But you can also disable fluid width – in that case page width will change on breakpoints and will not take entire available space. You can choose the layout of the home page: one, two or three columns. Display custom content in multiple sidebar blocks. Enable/disable Magento’s default sidebar blocks. 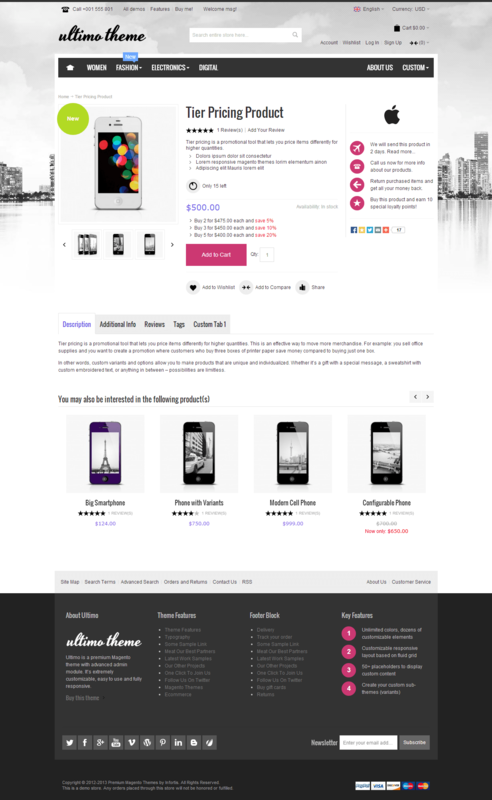 Clean and readable product page – your customers can easily find all important information. Configurable width of the main columns, prominent brand logo (with link to other products), product image (customizable size) with Cloud Zoom and lightbox, tabs smoothly turning into accordion on narrow screens, additional custom tabs and CMS blocks, sliders for related and up-sell products, social bookmarks, customizable product options… In short – adjust product page to suit your needs. 1) hide, 2) show 3) show only on mouse hover – for the following elements: “Add to cart” button, ratings (stars), “Add to wishlist” and “Add to compare” links. Set custom number of columns (products in a row): 2, 3, 4, 5, 6 or 7 for default screen resolution. On wider (or narrower) screens the number of columns will automatically adapt to the current resolution (it will also adapt itself whenever the size of the web browser window is changed). For example, on wide screens the number of columns will be automatically increased to show more products in a row. Switch between 2 styles of the drop-down menu: wide [demo] or classic [demo]. In wide menu you can display links in 4-8 columns. You can also display your custom content in a drop-down block. Colors are fully customizable. Unlike many other themes, Ultimo lets you create your custom sub-themes (theme variants). You can create season-specific designs to change the look of your store for holidays, Christmas etc. Ultimo can serve as a great foundation to implement individual designs for your clients. All layout modifications are stored in local.xml so all of the original layout files are kept intact. Fluid page width – if fluid width is enabled, theme will always use entire available space of the screen to display content. It can adapt to any screen resolution. If disabled, page width will only be changed on predefined breakpoints (from 240 to 1680 pixels). Sidebar menu – display sidebar menu (collapsible accordion) on selected pages. Enable it individually for: category pages, home page, CMS pages, product pages. Choose between left or right sidebar. Sidebar menu can also be displayed via shortcode in any CMS block and on any page. Product grid on mobile devices – additionally control the number of products displayed if browser viewport width is below: 640 px, 768 px and 480 px. 1, 2, 3 columns layout – you can choose the layout of the home page: 1, 2 or 3 columns. Display custom content in multiple sidebar blocks. Enable/disable Magento’s default sidebar blocks on home page. Multi-store ready – applicable for multi-store Magento installations. 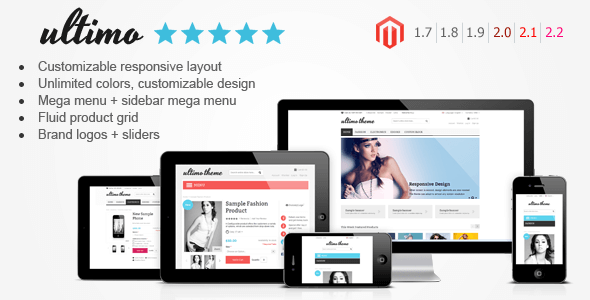 We guarantee that we will continue to update and improve this theme to keep it the best theme for Magento. Please take a look at the list of updates to see how fast Ultimo evolves. header in desktop view has correct width during page load. In previous version if option “Side Padding” under Theme Design > Header-Mobile > Inner Container was set to “Full Width”, then the header in desktop view was displayed as full width for a few milliseconds during page load. defined Google fonts are displayed correctly in admin panel on the list of available fonts (in a dropdown box). In previous version dropdown box was empty if Google fonts URL didn’t contain ‘&’ character. choose the number of digits after decimal point for the product label which displays saved amount of money. Useful when you want to show rounded value instead of precise percentage. category page and product page is not empty any more when custom labels are enabled. This could happen if option System > Configuration > Theme Settings > Product Labels > “Show Custom Label” was enabled and the custom attribute for labels didn’t exist (which was default state in version 2.6.0). enable accordion mode (only one filter can be expanded at the same time). If it’s disabled, multiple filters can be expanded at the same time. when configurable product has special price (i.e. some of its associated simple products have special price), the current price on product page is not marked with red color and doesn’t have the “Now Only” label any more. page background images which can be configured through admin panel (e.g. Theme Design > Page > Background Image) are now stored in this folder: pub/media/wysiwyg/infortis/_bg/. If your page had a background image, to restore it after the update you need to reupload the image through admin panel (and then clear the cache). if a category in the main menu was set as not clickable, it will not be displayed in the sidebar menu. A category is not clickable if the “Custom URL” field in the category configuration contains the hash character (#). static blocks added via widgets don’t have bottom margin (it was added automatically in previous versions). Thanks to that you have full control over the margin: you can add it (or not) using inline CSS or utility class inside the static block. if sidebar menu is enabled for product page (under Stores > Configuration > Menu > Sidebar Menu the “Product Page (Main Sidebar)” option is enabled and the “Product Page (Additional Sidebar)” option is disabled), the sidebar menu in the left sidebar on product page is not duplicated any more. 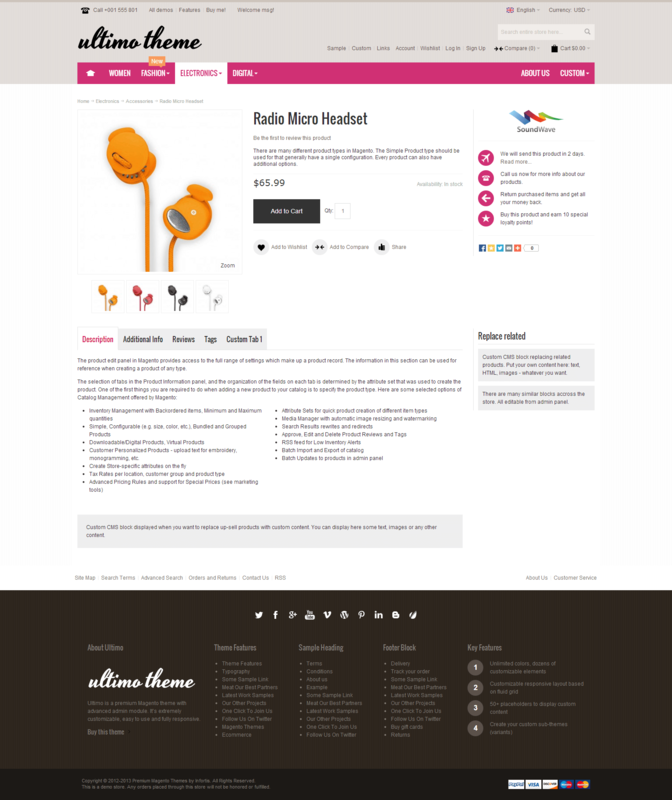 In previous versions the sidebar menu was duplicated on product page. in Firefox page doesn’t exceed the viewport width. In previous versions it could happen if sliders were displayed on the page. add custom static block inside the top header in mobile view (custom static block can be added through Magento widgets to the container named “Page Mobile Header, Top”). Content of the block can be aligned left, right or centered. restored two built-in static blocks “block_header_top_left” and “block_header_top_right” (they were removed in earlier version). These blocks are automatically displayed in the top header. design of toolbar and pager buttons in category view. Colors for these elements can be applied through admin panel. display of products list in the “list” mode in category view. It’s now similar to theme version for Magento 1: “Add to cart” button and price is displayed in a column at the right side. when a static block is added through Magento widgets to one of the top header containers (e.g. “Page Header, Top, Left” container), it is displayed on correct position. In previous version, each block added through widgets was displayed in a separate line which could split the top header into a few lines. store view switcher (language switcher) switches the store view permanently, not only on the current page. Also, page URLs are correctly translated when switching the language. brand name is displayed correctly in the tooltip when mouse hover over brand logo (in brand slider and on product page). In previous version, tooltip displayed the following text: “Click to see more products from %s”. page import: if option “Overwrite Existing Pages” is selected, message after import (“Items with the following identifiers were overwritten: ...”) displays correct list of overwritten pages. slideshow module doesn’t cause warning message in logs if no slides were set in the “Slides” field under System > Configuration > Slideshow > Main Slideshow on Home Page. In previous versions it could result in warning message: “implode(): Invalid arguments passed in /app/code/local/Infortis/UltraSlideshow/Block/Slideshow.php”. fixed bug which caused the following error: “Fatal error: Call to undefined method Infortis_UltraMegamenu_Helper_Data::getIsOnHome()”. Because of this bug page couldn’t be displayed when cache was enabled. ... And dozens of earlier updates. Full list of changes in older versions can be found in the Changelog.txt inside the theme package.